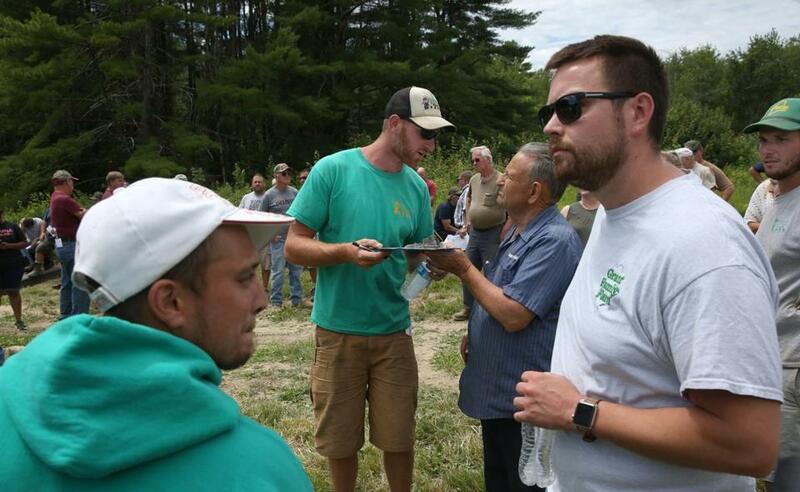 Ben Grant (center) during the auction of his family&apos;s farm in Saco, Maine. SACO, Maine — Rick Grant was known as the Corn King and Bean Baron of Maine, a seventh-generation farmer whose family has worked the land here since King George III handed them 25 acres of wilderness in the 1700s. The spread eventually grew to 300 acres, and Grant’s Farm became one of the largest in southern Maine, sending fresh corn, squash, beans, zucchini, and tomatoes to supermarkets and vendors in the area and beyond. But when Grant died last year at 57, the Corn King’s estate became locked in a bitter dispute that led directly to what was once unthinkable: an auction Thursday that attracted hundreds of family members, neighbors, and bidders to watch the old farm be sold. “I don’t usually get super-emotional, but I cried a couple times,” Benjamin Grant, the farmer’s son, said after the auction. In a small city facing development pressures, the sale of Grant’s Farm threatened another piece of the rural identity that many Mainers prize. So, friends of the Grants — and members of the Grant family themselves — felt no small sense of relief when they learned that Marcel Bertrand, a local businessman, had made the winning bid of $1.3 million and would search for ways to save the farm. “I do want to preserve it,” he said. A farmhouse and farming equipment sold separately for more than $600,000. John Graffan of Saco, who once spent three summers delivering food from Grant’s Farm to local grocery stores, was among those thankful for the outcome. “Of all the things to happen today, that’s the best thing,” Graffan said of Bertrand’s bid, which topped 400 cast on site and online. 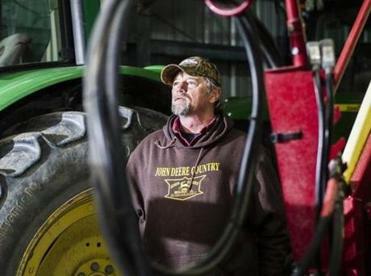 Getting to that point had been a rocky road, as Grant’s three children and their stepmother, Stacy Grant, became embroiled in a legal dispute over the farm. One of Grant’s daughters objected in a Probate Court filing to her stepmother’s appointment as special administrator of the estate. The daughter said that Stacy Grant had barred Benjamin from the farm, where he had helped his father for 15 years, and that she had no experience in running a farm, which would lead to financial problems. Handwritten additions to Grant’s will, which had been found in the bedroom after his death, depicted a family dynamic sharply at odds with the rosy relationship that had been reported in newspaper features. “I leave to Julie Hagerman a bottle of Grey Goose vodka,” Grant wrote about his daughter, who is now known as Julie Grant. “I leave to Benjamin Grant my biggest SCREWDRIVER IN MY TOOLBOX,” the farmer wrote of his son, emphasizing the bequest in upper-case lettering. Under the terms of the will, the farm went to Grant’s wife of three years, a former kindergarten teacher from New Hampshire whom he met on the dating site FarmersOnly.com, according to the Courier, the local newspaper. Grant summarized his farming philosophy in a 2006 video for the Hannaford supermarket chain, which bought much of his produce. Grant’s will was contested because the handwritten addendum had not been signed by witnesses, according to court documents. A settlement was reached last month: Grant’s wife was to receive half the proceeds of the estate, and the three children were to split the remainder evenly. Potential buyers attended the Grant family farm auction. For Thursday's auction, folding chairs were set up in the shade of the barn. A Ye Olde English Fish & Chips truck was parked on the property, selling cold drinks and French fries to a crowd of about 200 bidders, family members said. 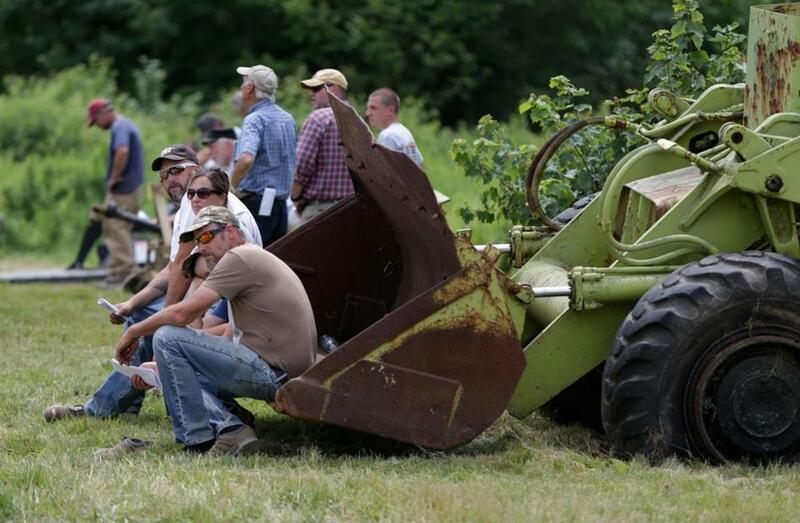 The bidders, most dressed in jeans and T-shirts, moved in a cluster down a dirt path lined by farm equipment and vehicles — tractors, an irrigation system, a rock picker, a wheel loader. Everything was for sale. After 20 minutes of bidding, Bertrand secured the farm, all except for a 10-acre parcel that was sold separately. Benjamin Grant later said he hopes to work with Bertrand, the president of Arundel Machine Tool, so that he can once again farm his father’s land, with the ultimate wish of buying back the property that has been in the family since Colonial times. That aligns with the hope of the Maine Farmland Trust, a nonprofit group that dispatched staff to Saco to watch the auction. “The Grant family is well-liked in that area, so there have been a lot of people pulling for this property to remain an active farm,” said Chris Cabot, who manages the trust’s farmland protection project. “This is a high priority for us, and it’s a special farm,” Cabot said. The future is uncertain, but Cabot said he is cautiously optimistic that Grant’s Farm will not be altered forever. That sentiment is shared by Lisa Grant-Wilkinson, the deceased farmer’s sister, who said Grant dreamed of seeing the farm passed down to his children and grandchildren. “That’s all he wanted,” she said.